CFES Brilliant Pathways and Southwest Airlines are teaming up for Aviation Day on April 9 to educate students across the Adirondacks about the growing number of good paying jobs in the airline industry – and how to access them. The Campus Reach Program at Southwest Airlines identifies and engages future Southwest employees at an early age to inspire an interest in an aviation career. 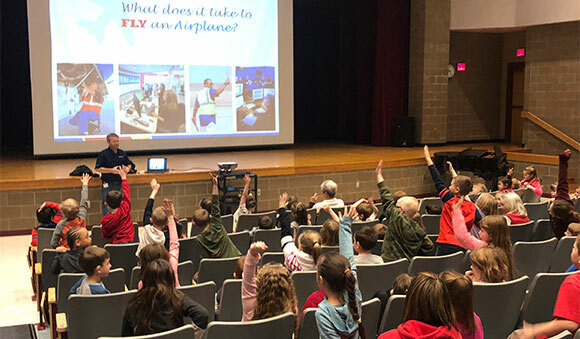 Teams from Southwest will be facilitating aviation lessons and classroom activities with students in Ticonderoga, Beekmantown, Crown Point, Malone, Moriah, Willsboro and Ausable Valley. Jobs within the airline industry are diverse and call for a wide range of skills. Some of the most popular jobs include customer service representative; airline administrative support; flight attendant; pilot; operations agent; security officer, air traffic controller; maintenance technician; aircraft mechanic; sales representative; facilities technician; reservations clerk; and inspector. During the CFES Aviation Day, Southwest has planned activities that are tailored to grade levels. These include aviation charades and leadership lessons based on the experiences of a woman named Bessie Coleman, who overcame obstacles to gain her pilot’s license; a paper airplane making contest and a teamwork-based session; a branding lesson for students to create a personal brand statement; and information sessions about opportunities in the airline industry. The innovative collaboration between CFES and Southwest is part of an $11.6 million U.S. Department of Education GEAR UP grant awarded to CFES to support 2,075 students in seven rural school districts in Clinton, Essex and Franklin Counties. The grant includes support from corporate partners like Southwest as well as local colleges and universities, a network of six hospitals, and local businesses and non-profits. Nearby Plattsburgh, Albany and Burlington (VT) airports employ upwards of 2,000 people. Albany International Airport employs over 1,000 people with salaries ranging from minimum wage in food services to $100,000 plus for aircraft mechanics. “We offer jobs ranging from minimum wage to very competitive salaries,” said Doug Myers, Director, Public Affairs at Albany International Airport.